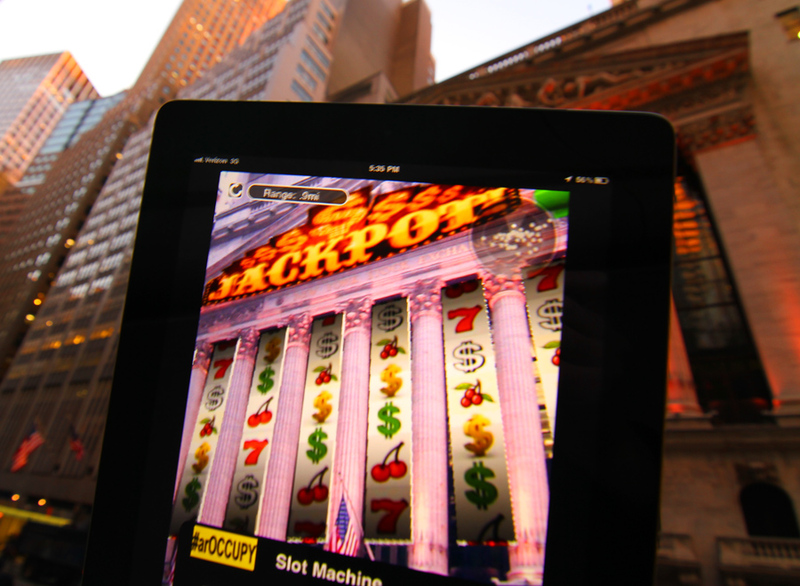 GLOBAL CALL — Augmented Reality Activists to WALL STREET!! 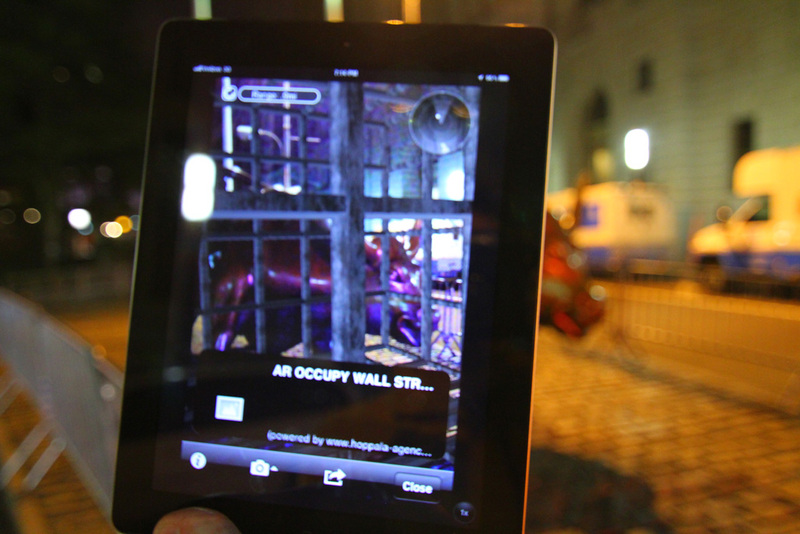 This site is dedicated to the augmented reality occupation of Wall Street #arOCCUPYWALLSTREET in conjunction with the #OCCUPYWALLSTREET movement. Augmented Reality Flash Mob @ Wall Street! Protesters were not allowed to protest at Wall Street forcing them blocks from the New York Stock Exchange [NYSE] to the Zuccotti Park. Wall Street was barricaded off. Only part of the sidewalk is accessible to the public and there is a constant police presence around both the protesters and the NYSE at all times. #arOCCUPYWALLSTREET takes the protest to the heart of the financial district, placing them directly in front of the NYSE. Augments now blanket the entire financial district. 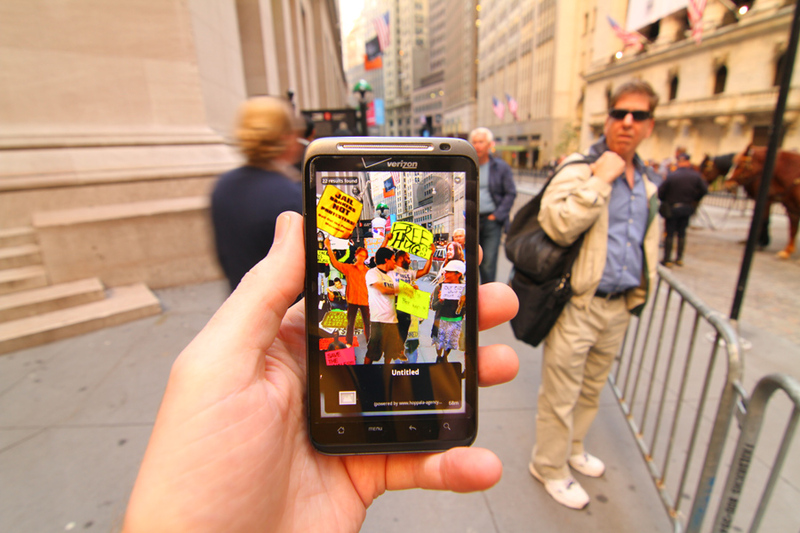 Augmented reality gives protesters a global voice. The protest has spread to the White House lawn! Please join the cause and augment Wall Street! We brought the protest to the NYSE. In a sign of support for Occupy Wall Street, as of October 1, 2011 I stopped paying my mortgage . I figure since banks manipulated my mortgage payment to them at disproportionately inflated real estate prices then it is my turn to manipulate my repayment to them. I suggest there is a similar response from as many mortgage holders as possible. Only such money withdrawal actions will bring a response. Are you prepared to be homeless in support of OWS? You did sign and agree to the mortgage. Having said that, It does not make me sad in the least to think of people refusing to give their money to the banks. The enemies of our country should be fought be the means at our disposal. I just think you might be hurt more by this than they will. Signing a document based on false prognostical information is invalid. The bankers qualified my loans when they shouldn’t have as they knew fully well that when the bubble bursts no amount of blowing it back up will save it. The banks are the expert manipulators with numbers. We, the people, based our real estate actions as a function of the history of real estate. Some were lucky others were not. It depended at what time people jumped on the pyramid scheme. Most of the economics are based on a set of rules that are functional only when everybody follows them. The banks stopped playing by them, so did I.
I wish you success in striking at our mutual enemy. Alex – did they cheat you after signing the paperwork? Did they change the terms after signing? Not only did they cheat during the signing of the contract but 2 years later, when we threatened Downey Savings with a lawsuit they refunded us $4,000 in illegal broker payoff fees….. and that’s without a lawyer. Then upon the failing of Downey Savings they were taken over by US Bancorp, another bunch of 13 white collar criminals. The point is that the banks knew that soon or later the Ponzi scheme must fail. The US should’ve arrested & prosecuted 100’s if not 1,000’s of bankers way back during the Savings & Loans fiasco. All the law did was slap a few scapegoats with minimal jail time.